The ability to sense the presence of microorganisms that could cause potentially dangerous infections is a widespread property of cells, tissues and body fluids of all multicellular organisms. This process is called innate immune recognition. This recognition process is the first crucial step triggering the complex sequence of events by which the body protects itself against infection. However, it is only since the 1980s that most of the molecules (receptors) responsible for this recognition process have been identified, and new examples of such innate receptors are still being found. The receptors usually recognize components of microorganisms that are not found on cells of the host, e.g. 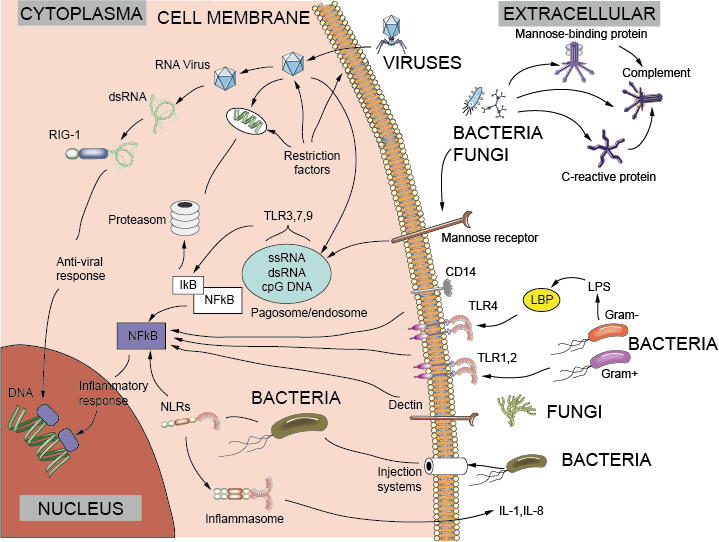 components of bacterial cell wall, bacterial flagella or viral nucleic acids. These target molecules have been named pathogen-associated molecular patterns (PAMPS), and the receptors that recognize them pattern recognition receptors (PRRs). Engagement of PRRs by PAMPs results in activation of intracellular signaling pathways, resulting in alteration in gene transcription in the nucleus (left part of figure 1) and ultimately a whole variety of different cellular responses, broadly termed inflammation. Some innate immune receptors are also triggered by damage to cells that arises in the absence of any infection, giving rise to the term damage-associated molecular patterns (DAMPs). The activation of innate immunity is an essential prerequisite for activation for most adaptive immune responses. Leucine-rich repeats (LRR): A ubiquitous protein structural motif, forming a ‘horseshoe’-shaped fold, with an exposed hydrophilic surface and a tightly packed internal hydrophobic core. It is so named because it contains unusually large numbers of the hydrophobic amino acid leucine. LRRs are frequent components of PRRs, where they are thought to mediate the interaction between the receptor and the target structure on the microorganism. Families of proteins containing LRRs may also serve primitive antibody-like functions in several types of invertebrates. Toll-like receptors (TLR): Toll-like receptors are so named because of their homology to a gene named Toll, first identified in Drosophila. TLRs were the first PRRs to be discovered, and have come to represent the archetype of innate immune recognition receptors. Humans have 10 TLRs, each with an LRR domain involved in recognition of microbial components, and an intracytoplasmic TIR domain involved in signaling into the cell. TLRs associate with a variety of adaptor molecules that help to convert recognition of microbes into a signal, which activates specific gene transcription within the cell. RIG-1: Many viruses carry their genetic information in the form of RNA, rather than DNA as do all eukaryotes. RIG-1 is an example of a family of molecules that recognize RNA viruses such as influenza, picornaviruses (common cold) and Japanese encephalitis virus, and then switch on the production of interferons and other antiviral proteins. Cell surface: Innate recognition receptors at the cell surface recognize extracellular microorganisms. The best studied example is TLR4, which together with accessory molecules MD2 and CD14, recognizes lipopolysaccharide (LPS), the principal component of Gram-negative bacterial walls. TLR4 is distributed on many cell types, but is especially important on macrophages. Excessive activation of macrophages is thought to be a major factor in sepsis and endotoxic shock, which leads to oedema and low blood pressure, and can be fatal. Cytoplasm: Many microorganisms can efficiently cross the cellular membrane and colonize the cytoplasm. Viruses are the best known examples of cytoplasmic pathogens. However, many bacteria can also either cross the membrane into the cytoplasm (e.g. Salmonella) or can inject toxins and other bacterial components into the cytoplasm. Intracytoplasmic bacterial components are recognized by the NOD-like receptors. NOD-like receptors: These are a large family of cytoplasmic proteins that contain leucine-rich repeats, which bind to bacterial components. NOD1 and NOD2 recognize fragments of bacterial cell wall proteoglycans, and are found at particularly high amounts in the epithelial cells that line the gut. Mutations in NOD2 have been found to increase the likelihood of developing Crohn’s disease, a chronic inflammatory gut disease, perhaps because of a deficient response to bacteria in the gut. Some NOD-like receptors activate the transcription factor NFκB. Others activate the inflammasome. The inflammasome: This is a multimolecular complex that is assembled in response to triggering of some NOD-like receptors, and leads to the secretion of active forms of the inflammation-promoting cytokines IL-1 and IL-18. Persistent activation of the inflammasome by crystals of uric acid is thought to cause many of the symptoms of gout. In some cases, activation of the inflammasome results in the rapid death of the host cell by a special process known as pyroptosis. Restriction factors: A collection of proteins that inhibit the ability of viruses to replicate. Trim5α binds retroviruses and carries them to the proteasome, an intracellular organelle that destroys them. Tetherin, as its name suggests, binds to some viruses as they bud off from the cell surface, limiting the ability of the virus to spread. New restriction factors are continually being discovered. The endosome/phagosome: Many microorganisms are taken up by endocytosis or phagocytosis by macrophages. Several TLRs sense microorganisms within these compartments. TLR9 recognizes a type of DNA found predominantly in bacteria and viruses, but rare in eukaryotes (CpG DNA). TLR3 recognizes double-stranded RNA, found in many viruses. TLR7 recognizes single-stranded RNA, which is found in many RNA viruses. Although single-stranded RNA is also a ubiquitous component of eukaryotic cells, it is unstable and cannot survive in the extracellular environment. It therefore seldom enters the endosomal/phagocytic system. CRP: C-reactive protein (MW 130 000), a pentameric globulin (or ‘pentraxin’) made in the liver which appears in the serum within hours of tissue damage or infection, and whose ancestry goes back to the invertebrates. It binds to phosphorylcholine, which is found on the surface of many bacteria, fixes complement and promotes phagocytosis. Mannose-binding lectin (MBL): A serum protein that binds the sugar mannose, which is often found in large amounts on bacterial or fungal surfaces, but is usually not exposed on mammalian cells. Binding of MBP to microbial surfaces then activates complement. NFκB: NFκB is a key transcription factor regulating the inflammatory response. Normally, it is kept inactive in the cytoplasm by binding to the inhibitor IκB. However, activation of many PRRs results in destruction of IκB by the proteasome, and NFκB then moves into the nucleus where it switches on many components of the antibacterial, antiviral and inflammatory response. Proteasome: A cytoplasmic organelle whose major function is to break down proteins and recycle their constituent amino acids within the cell. It also has a key role in producing the peptides recognized by the T lymphocyte. Dectin-1 and the mannose receptor: These are just two members of an enormous family of sugar-binding proteins known as C-type lectins. They have an important role in binding to fungal and bacterial cell walls, activating phagocytosis and inflammation.